Members of our team have advised on a large number of corporate and commercial transactions. The following are select, representative examples. Represented an Asian gold mining company in a global initial public offering of securities of its Thai gold mining subsidiary, including a registered offering of ordinary shares in Thailand and managing compliance for the offering in Asia Pacific and Europe. Represented an American multinational corporation and worldwide leader in networking systems with a $3.3b post-acquisition integration into the acquirer’s existing entities across Asia. Represented a French multinational consulting, outsourcing and professional services company in relation to its $750m acquisition of a worldwide consulting business. Represented one of the Big Five banks in Canada in a $650m Oman bank offering. Represented one of Europe’s largest private equity sponsors in a strategic sourcing initiative to establish one of its portfolio companies as an independently operated company as part of its $570m acquisition. Represented a global footwear and apparel brand in connection with numerous corporate initiatives throughout the EMEA, Asia Pacific and Latin America regions including the migration of an IP portfolio to an off-shore holding company, the implementation of a selective distribution policy in the European Union, and multiple cross-border acquisitions, divestitures, licensing and distribution transactions. Represented a European private equity sponsor and its portfolio company in the proposed acquisition of two US based media and entertainment industry targets, an equity rollover and the restructuring of the combined operations of the portfolio companies. Represented a Fortune 200 science and technology leader on a multi-billion dollar joint venture to create a global consumer business in over 30 countries. Represented a global foreign exchange and payments business on the £600m sale of its Business Payments division. Represented a US listed company on its $350m acquisition of a pre-paid card business. Represented an investment bank in underwriting the $330m IPO of a large power plant developer on the NYSE, the first Chinese company's IPO in the US. Represented a US based entertainment retailer on its entry into the UK by way of £350m public company takeover, and on its entry into Australia by way of $210m private share acquisition. Represented a listed financial services company on the demerger of its UK assets. Represented shareholders in the share sale of a UK risk analytics and advisory service company to a US listed entity. Represented a leading online insurance agency and portfolio company of funds on its sale to a NYSE listed financial services holding company. Represented prominent international media proprietors’ interests on the restructure of assets by them and a multinational mass media company ahead of the listing. Represented a German diversified health care company in acquisition of certain healthcare management company's international operations involving four countries. Represented an Indian conglomerate holding company in an auction purchase of an American visual effects and digital production company. Advised a Beijing municipality on the 2008 Olympic Games financing and asset restructuring. Assisted US based and NYSE listed telecommunication companies in various assets acquisitions in Mexico, Brazil and Argentina. Acted on the convertible debt offering and listing of a company that engages in the acquisition of agribusiness projects on the Luxembourg Stock Exchange Euro-MTF market. Acted as primary North American counsel for the US subsidiaries of numerous leading private and publicly listed European companies. Represented a leading Italian rotational molding manufacturer in the acquisition of a US and Canadian rotational molding manufacturer. Represented a leading European water treatment company in its US expansion through a joint venture with a leading US water treatment company. Represented a leading Italian global integrated logistics operator in its US and Latin American expansion through a series of strategic acquisitions of defense and commercial logistics operators in the US. Represented a Fortune 100 media conglomerate in the structuring of foreign investment in China, as well as licensing and distribution throughout Asia. Represented a leading global footwear company with the reorganization of its international supply chain function, including the migration of assets to a Singapore based affiliate. Represented a Fortune 500 multinational corporation in its $800m asset disposition. Represented foreign investors in coal bed methane projects in China, advising on structuring the investments and negotiating and drafting the acquisition and related agreements. Represented a French multinational food and beverage company in the settlement and sale of its 51% share in a series of Chinese joint ventures, involving significant regulatory issues. Represented one of the largest Chinese dairy producers on its acquisition of the controlling equity in one of the largest New Zealand dairy production companies. Acted for a Belgian based beverage company on the restructuring of its two Sino-foreign joint ventures in China. Acted for a US based poultry processor to establish a joint venture in China, including government approvals, negotiation and documentation, compliance and business operation advice. Represented a US-based publicly held manufacturer in connection with a global, long-term supply agreement with a leading fast-food restaurant chain to supply equipment and products to all restaurant franchisees worldwide. 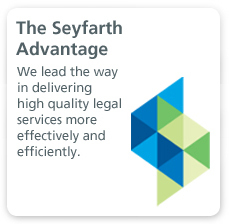 As part of this engagement, Seyfarth also advised on US and European antitrust matters. Represented numerous companies of a publicly held manufacturer in various manufacturing and supply agreements throughout the US, Europe and Asia. Represented a top 100 global brand consumer products company in connection with all of its agreements with third-party suppliers in the US. Assisted the legal department of a domestic supermarket chain that operates 700+ grocery stores with a high volume of commercial contracts, including third-party distributor and supply agreements. Represented a publicly listed manufacturer and distributor of footwear and apparel in negotiating and executing its domestic and international customer and vendor agreements. Represented a publicly listed manufacturer and distributor of commercial kitchen appliances in negotiating and executing its domestic and international customer and vendor agreements. Represented several publicly listed companies in routinely reviewing and updating Standard Terms and Conditions with respect to sales to end users / customer agreements. Represented global footwear and apparel brand in connection with the implementation of a selective distribution policy in the European Union. 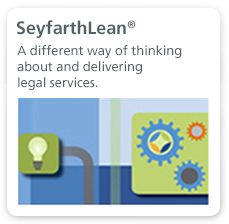 Seyfarth helped the client develop their overall strategy for the distribution of products throughout the EMEA region, drafted the relevant policies, and handled all communications and contract amendments with customers, retailers and distributors. Represented Fortune 50 company in the drafting and negotiation of a variety of technology contracts, including software, license agreements, SaaS agreements, and various consulting arrangements. Represented one of the largest publicly traded personal lines property and casualty insurers in the US in connection with the negotiation and implementation of a new enterprise cloud-based, outsourced solution related to the marketing and sale of insurance products by insurance agents nationally. The outsourced information technology and related services are to be provided on a multinational basis. Represented a national insurance claims data processor in the development of its contracts with customers concerning the licensing of its software products, the development of customized software solutions, and the provision of long-term outsourced data processing services. Represented a large food products manufacturer in connection with the outsourcing of all of its enterprise-wide hardware and software needs, including the acquisition of hardware, licensing of additional necessary software, and performance of long-term services related to the ongoing operation of the company’s information technology. 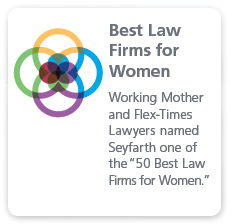 Seyfarth was also involved in the selection of the vendor as part of a request for proposal process, and the negotiation of all related agreements. Represented a Fortune 500 global computer security software corporation in the large scale, complex outsourcing of facilities management services around the globe. The project covered more than 50 countries and included almost all of our client’s facilities. The project scope addressed more than $100 million in annual spend. Represented a global IT company on the insourcing of accounting services, including transfer documentation and implementation in more than 70 countries.